Body love for sensitive skin from Aveeno, Dr. Roebuck's and Avon! 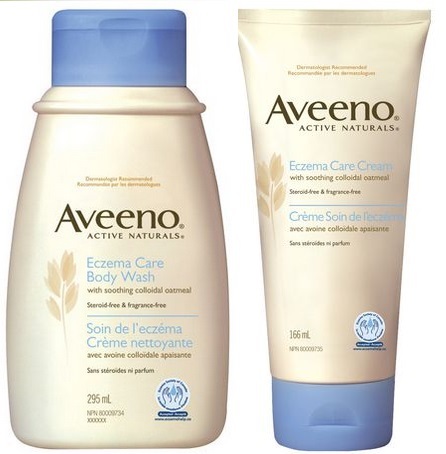 Aveeno Eczema Care - with a triple oat formula containing oat essence, colloidal oatmeal and ceramides to soothe irritated, extra-dry skin while gently moisturizing and strengthening the skin's moisture barrier: Body Wash - 295ml - $11.99 - gently moisturizes while it cleanses itchy, extra dry skin and Moisturizing Cream - 166ml - $11.99 - helps to soothe red and irritated skin and provides moisturization for a full 24 hours while helping to strengthen the skin's moisture barrier to prevent the recurrence of irritated, extra dry skin. Available at drug, food and mass retailers across Canada. If you want something super gentle for the body but still need something that smells great then you'll love Dr. Roebuck's - designed for sensitive and reactive skin so it can be used every day and with a naturally derived fragrance that will make you want to! Dr. Roebuck's Body and Handwash - 250ml - $18.95 - cleanses and soothes the most sensitive skin without reaction with a combination of neroli petitgrain along with thyme and basil to ensure clean, fresh and revitalized skin that smells wonderful and Pure Body - 250ml - $29.95 - a dual-acting moisturizer for the whole body that works with a combination of natural powerful antioxidants and anti-aging properties of white tea, macadamia oil, vitamin E and neroli petitgrain combined with shea butter to moisturize and tighten. Available now at Murale and select Shoppers Drug Mart locations. Avon Moisture Therapy Derma Soothing - soothing, fragrance-free relief for rough, dry skin that is suitable for eczema-prone skin: Body Wash - 200ml - $12 - gently cleanses while soothing dryness with vitamin E, aloe and chamomile and Body Lotion - 200ml - $12 - with powerful moisturizing benefits of an ointment in a light cream enriched with Skin Lipid Complex - with smoothness and clarity being significantly improved with just 5 days of use.